A leaky roof is never a good thing. But it's just one of the many problems Ken Gloss has encountered this winter at the Brattle Book Shop in Boston. "We don't normally have a leak there, a leak there, a leak there," said Gloss, pointing at different parts of the ceiling. "We've had leaks, we've had icicles, we've had snow blowers breaking." Missing ceiling panels and water marks are noticeable around the third floor of his shop. But he says he's thankful he saw the leaks in time. While some of his books are damaged, he says it could be much worse - especially considering the most expensive books up there have a price tag between $10,000 and $15,000. "A lot of these books ... are from the 16, 17, 1800s," said Gloss. "Rare books, signed books, autographed manuscripts." Now Gloss and his employees are taking added steps to ensure future storms won't cause more damage. 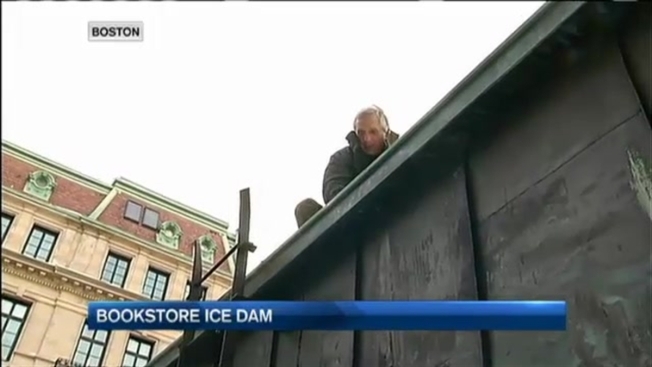 They've been shoveling the roof and are careful to keep it covered in ice melt. But it's not just the books that are a concern. He says this frigid and snowy winter has had a major impact on business, with customers either too cold to head out or simply unable to get into it around the city. Gloss estimates sales are off by about $50,000 to $60,000. "In this building, since the last 30 years, this is, by far, the slowest, business-wise," he said. Gloss says they will push on despite the problems and says he has sympathy for other businesses suffering from the same things this season. He is looking forward to the warmer weather come spring.